Scuddy died sometime last night after I went to bed. I took her to the vet yesterday morning and got her on oral antibiotics, but despite the vet saying she didn't look too bad off I guess it was too little, too late. She wasn't a rat, by the way. She was a hamster. I just liked to call her "my little white rat." Poor Scuddy. I am sure he is happy in his habitrail in the sky! I'm sorry, heeweegee. 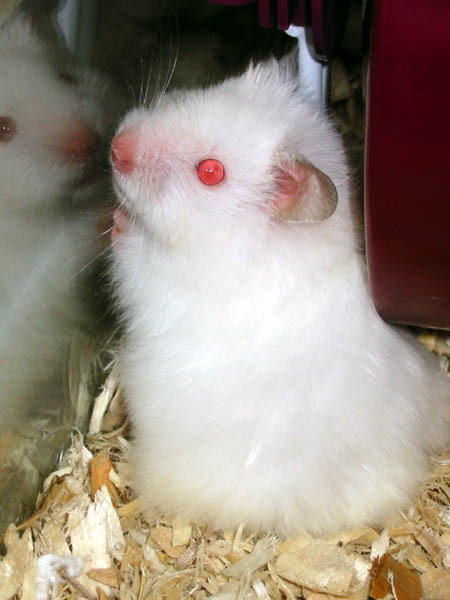 Scuddy was probably the only hamster you didn't hate on sight :(. My condolences to Mr. Scuddy. Would that it were a BB hamster instead.